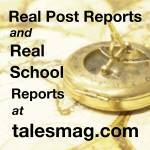 For those of you that haven't heard of DiploPundit, it's one of the most popular blogs that "monitors the goings on at ‘Foggy-Bottom’ (i.e. the State Department) and the 'worldwide available' universe from Albania to Zimbabwe." So you'd think that getting mentioned in it would be a good thing, right? Well, it depends...but as far as I can tell, if DiploPundit calls you out, it's usually not for something good. Recently, my Bureau (Overseas Buildings Operations, or OBO for short) has found itself once again in the DP's cross-hairs. And while there is some truth to be found in the article, there were also a few points that were slightly off the mark. The DP blog post in question addressed an anonymous post to its site that highlighted how the FSCE retention rates have suffered under the "Excellence" initiatives of "Design Excellence" and the rebranded "Excellence in Diplomatic Facilities" (EDF) initiative. The EDF moniker came into existence after its predecessor "Design Excellence" lost the public relations war. Notice that the term "Design" was dropped in favor of the more broadly inclusive "Facilities"? Don't get me wrong, I like a pretty building as much as the next guy, but this actually isn't about the building at all. So what's the issue here? First, a little background on how OBO is organized, and an acknowledgement that architects and engineers approach solutions differently. You've probably seen the project construction cycle tree swing graphic floating around your office, but if you haven't, check the link. I wouldn't be surprised if both the AIA and NCEES professional licensing exams for architects and engineers (respectively) contain this True/False question: There will always be animosity between the designers and builders because some designs can't be built. The answer is "True." Program Development, Coordination and Support (PDCS) "designers"
Construction, Facilities, and Security Management (CFSM) "builders"
It's important to realize that OBO has both Civil Service and Foreign Service engineers, but you will only find the Foreign Service Engineers (both Construction Engineers and Facility Managers) in CFSM. Foreign Service Engineers rotate back into D.C. from project sites abroad every so often, but the Civil Service staff pretty much stay based in D.C. for their career. In the other camp, PDCS, you'll find most of the hard-core civil service engineers and practically all of the architects. They do their work in D.C. with field trips and site visits during the project life cycle. But in an attempt to make things simple, let's just say that there are CFSM-Engineers (Foreign Service and Civil Service), PDCS-Engineers (Civil Service), and PDCS-Architects (Civil Service). White Pin-striped area within CFSM are Foreign Service engineers, mostly FSCEs but I'm including Facility Managers because there are twice as many of them as FSCEs. FMs are focused more on maintenance than construction, but FMs are often the FSCE's connection to Post in the field. Go team! White Broad-striped area are Civil Service. 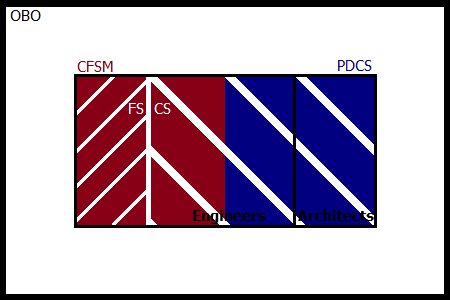 As you can see, there are CS in both CFSM & PDCS. There are also contractors of various forms (PSC & Third-Party), which includes the 5-year non-career positions mentioned in the DP article. It's worthy to note that these contractors don't get all the benefits of being in the Civil Service, so they would probably balk at being lumped together with them. Engineers: Ok, technically there are also trained architects in CFSM, but their duties focus broadly on construction and not specifically on design. For that reason, I've counted them under the engineer umbrella. Architects: This includes both the design architects as well as the trained architects filling the project manager (PM) role. Since they both usually approach projects from an architect's perspective, I've counted them all as architects. There are also engineers that function as PMs, but all of these folks are within PDCS and predominantly civil service. So, you can see that while correctly specifying all the different job announcements and statistics, Diplopundit was uncharacteristically off the mark and might have confused some of the groups when referring in general terms to "OBO Engineers." And that's not really surprising, because to most everyone else out there in the Foreign Service, OBO is this monolithic entity that just seems to show up when it wants to and follows its own rules while making Post live in or around a construction site for the rest of their tour. That's why my drawing cheekily represents OBO as a black box (of mystery). And admittedly, how engineers in the field represent OBO to post can form lasting impressions there of both the engineer and the entire OBO organization. It's hard to tell from the comments which group within OBO the complaints DiploPundit referenced were coming from (other than the one about having to attend three schools in three countries...that guy's definitely in the Foreign Service). The point about rebuilding experience every five years is much more of a PDCS-engineer issue than a CFSM-engineer issue because those are the resident experts who might be hired in on five-year contracts (notably, PSCs). And to be completely honest, throughout the halls of OBO I've heard these same comments about OBO management favoring big-D Design and concerns about the power dynamics between running a project in the field or remotely from D.C. However, hearing and understanding are not really the same thing. Personally, I think that both sides have a point, but each probably feels like the other side isn't listening to them. And these relationships are vitally important, because it's how we get things done. For those outside the construction world, there's more to putting up a building than just putting up a building. If only building embassies was as simple as raising a barn. What it really comes down to how the contractual obligations and responsibilities differ for various groups within OBO as it related to two execution methods. The U.S. Government, via OBO, always fills the roll of the owner. The difference is how the Design Firm (A/E) and Construction Firm (General Contractor) are contractually related. Depending on your priorities, one method might be more preferrable than the other. Design-focused Design-Bid-Build (DBB): The Excellence initiatives bring in World-class architects under contract to create complete plans for signature buildings. These should result in ready-to-build drawings (think Lego manuals) that construction contractors can then follow. 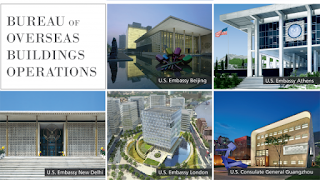 The major complaint from the engineers (and Congress) is that State has so many requirements for its embassies that there is a steep learning curve for design firms, and many question the world-class price tag when costly design issues are discovered by the OBO team or contractor in the field that might delay project completion. When problems arise, you might hear unhelpful comments like "Those fancy architects know how to wear turtlenecks and drink coffee, but they don't know the first thing about getting a building built." This arrangement puts PDCS Program Managers in D.C. (a mix of engineers and architects) in charge of the project design (the Design part of DBB), but doesn't require much contractual responsibility after the construction contract is awarded (the Bid-Build part) to see the project completed. The PDCS argument is that they should have cradle to grave responsibility, but Project Directors in the field (primarily CFSM-engineers) argue (rightly) that they are the ones ultimately responsible for completing the building while fixing design errors & omissions along the way. 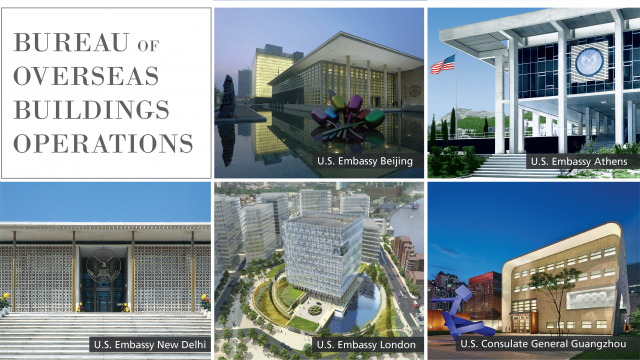 Construction-focused Design-Build (D-B): The Standard Embassy Design (SED) is often characterized by the pro-architect camp as "boxy", "cookie-cutter", "one-size-fits-all" or "generic." But from an engineering point of view, doing something the 30th time means that we've basically ironed out all the problems...why introduce new ones when the goal is to get people into safer and more secure facilities as soon as possible? That's part of why the SED program gets touted as cheaper and faster. It also usually puts the CFSM-engineer in charge of completing both the design and the construction under one contract, so design errors can be fixed more easily (and arguably more cheaply) during construction. This arrangement is very effective for designs that are standard and don't require top-dollar architectural skill. Sure, you might get to pick out different colors and materials for your interior and exterior finishes, but that's kind of like buying a house from a developer that offers you choice between maple and oak kitchen cabinets. Which I think is part of the reason you hear these projects derided by the Design-camp as being un-inspired fortresses. But in reality, there are some places that making a world-class building with a cutting-edge design is going to present significantly more difficult logistical challenges than others. Consider how much harder it would be to find the specialized skilled labor that's locally available in London out in somewhere like N'djamena, Chad. So, if the goal is to have a safe and secure facility for the American presence in a country in turmoil, the argument goes, the contract delivery method should be Design-Build. Every organization has some sort of internal politics, and that includes State. Compare these posts from the Foreign Service perspective and Civil Service perspective. As you're probably aware, public perception can often be influenced by the loudest voices...voices which might not be completely unbiased. So you need to understand not only what is being said but who is saying it. I tried my best to be objective in my response, but at the end of the day, I'm still a Foreign Service Construction Engineer. When I leave (by which I mean retire from) the Foreign Service, I've considered switching teams and joining PDCS to be a Project Manager...so hopefully they agree with my assessment of our relationships. I still see us as one big team moving forward to complete the OBO mission, but group dynamics still need to be accounted for. Within the State Department, OBO is a rather unique (and a little mystifying) bureau to those on the outside. Try searching most Foreign Service blogs for "OBO" and you'll come up blank. Unless you go with this one, who I get the impression might have a bit too much interest in OBO, but I think he works in Diplomatic Security which is a whole other relationship saga. The US government earnestly desires to exemplify American values to the world through our diplomatic facilities while ensuring our personnel are safe and secure. But there will always be a challenge in finding the right balance between openness and security (see comment & link above).